Hi. My name’s Lynn. Before I tell you my tale let me tell you just a little bit about me. I’ve had some sort of arthriticy condition in my left ankle for nigh on 25 years and just to add to my woes in 2014, around July time, I was suddenly struck down with extremely painful joints. This was quickly diagnosed as Acute onset Rheumatoid Arthritis, an auto-immune disease so treatment to manage the condition started. Roll the clock forward to April 2015 and the potent drugs were doing their job, easing the pain and I’d started to get out walking the pooch again. I was scrolling through Facebook seeing all these events folk were doing, OCR, Cycling, Hiking, Climbing, all sorts of things, and thinking ‘they look fun, I’d like to have a go, but I’d never have the courage to do them, still I can dream….’ When I stumbled across E3Coach.com. I messaged asking ‘what is the minimum ability you take?’….’there isn’t one’ came the reply, “great I’ll sign up to a plan and my goal is…..to walk my pooch five times a week! Two weeks in and I was loving it, and I owned up to there being a public swimming pool nearby and a perfectly serviceable bike in the garage. My training plan looked a little different after that, but there was still absolutely no way, no not ever that I’d be entering any event, despite the fact that the itch was growing….well I have…first a charity night, ride, then a few road sportives and even a sprint triathlon, but I’ve also discovered mountain biking and I love it! Time to be with friends, to be alone, to be happy, to be sad, and then there’s the jeopardy that I just love, and since it takes nothing more than a small stick across my path to make the ride interesting, getting a buzz from the fear is easy to achieve! in 2016 I picked up a shoulder injury which meant no training for several weeks and sketchy at best ever since, which has also led to rapid deterioration of my left ankle and double major surgery looms, after which no bikes for at least a year, possibly longer if ever…So I decided that in 2017 I have to tick the boxes of as many of the things I have an itch to do as possible, and right at the top of that list was participate in a MTB race…. So…. My chosen event was Southern Series XC round 1 at Wasing Park, in the E3Coach sponsored Open category, which is a new format for 2017, to make MTB racing at SSXC accessible to all, you just have to complete one lap to record a finish time although the race is 3 or 4 laps depending on the course. The day before, the TrailX duathlon had been held at the same venue and reports of great conditions were all over social media. I was excited, anxious and determined all at the same time, but overnight the weather gods had come out to play and run a mock over the course, it was wet, muddy, oh my muddy like you’ve never seen, mudfest, slopfest call it what you will it was dreadful, especially after the Mens Open and Sport categories had raced. I pushed, pulled, dragged and even rode my trusted steed along a few sections on a practice lap, but after 2hours and 23 minutes, a pulled finger, hungry and tired I decided that my goal was to do a MTB race, not the first round at Wasing just a race, and so I called it a day at that. Even experienced riders were saying it was a tough course and worse than anything they’d ever seen, one elite rider dropped her chain 11 times in one lap so I’m pretty sure I made the right decision. Home to click enter for round 2, at Checkenden. So race day take 2 arrived. For some reason I had been much more anxious about this one, even muttering that I might not actually do it, so when the alarm went off on that Sunday morning unlike the morning of the Wasing event, I very reluctantly dragged myself out and in no rush got myself sorted and out of the door. Really quite unsure that I would actually do this I wanted to remain fairly anonymous. After collecting my number board and attaching it to my steed I returned to the arena and sat having a cup of tea thinking I really should try a practise lap, but I just lacked the confidence to go out, my legs were like lead weights. Then a family I have met on a Fleet MTB ride suddenly appeared, Helen was also racing. Now my cover was blown and there was no way out! I became aware of there being very few ladies around and when I looked I saw that the whirring noise I could hear, was the ladies warming up on rollers. Time to get my shiz together then I suppose. Feeling sick to the pit of my stomach, I trotted off and dutifully got the steed out and ‘warmed up’ well trundled up and down desperately trying to keep out of the way of the ‘proper athletes’, still trying to just blend into the background. 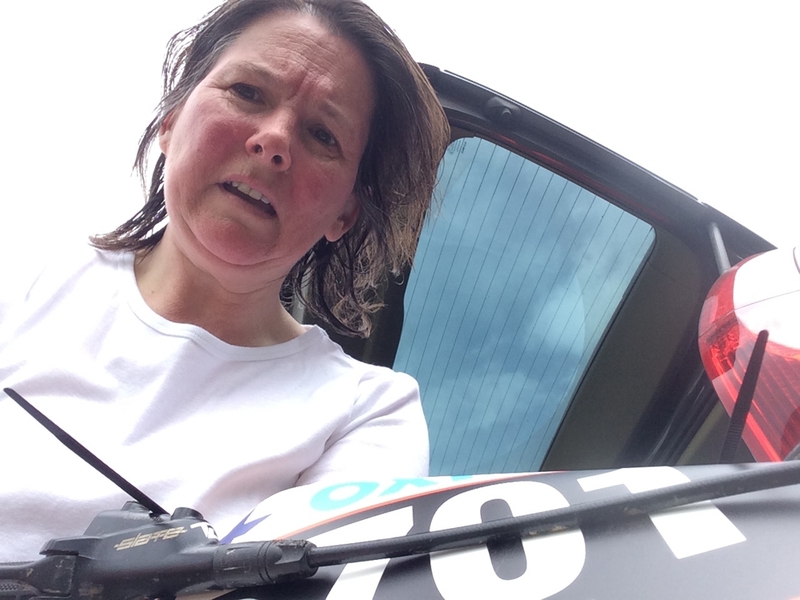 ‘This is the face of someone about to do first ever MTB race  but is actually thinking 'time to bail.. whatever possessed me to think this was a good idea! Riders started to congregate around the entrance to the start funnel, so I did too, surreptiously trying to ascertain who was also in the Open race, 57 was the clue. They all seemed confident, relaxed quite at home with it all. Oh yikes! So here was I a whisper away from my 55th birthday about to participate in my first ever race…of any kind let alone a MTB race!!! The Commisairre was calling riders forward, and panic set in, I had no idea how this gridding lark worked, I should’ve found out, which side was I going to have to go, would I be in trouble, disqualified before I even started if I got it wrong? Heeeeelp! In the event, the Open category wasn’t gridded, we just lined up at the back of the other riders. There was various chit chat, who’d raced what etc.and the eldest of the other riders in the Open Category was at least 15 years my junior, it sounded as if they had all raced before. Well I hadn’t, but I was about to, although it wasn’t too late to bail……. With my oh so dodgy ankle I often have to ‘scoot’ to get going and I was really worried that I was going to be the laughing stock not even able to get riding, I knew I would be well off the pack within the first 100m which was going to be bad enough but I was OK with that, it just is what it is. The moment approached, the boys junior race had set off and then the ladies were called forward, heart rate suddenly shot up, no bailing now… but this was what I wanted to experience, that thrill, the adrenaline rush. You could feel the tension had suddenly rocketed, no more the sound of happy chatting, comparing notes, but race faces on, focus, silence, words of encouragement from the sidelines, called to order.. I couldn’t tell you whether it was a gun, a hooter, a whistle or the chime of Big Ben that sounded the start of the race, I just remember we were under way, that absolute adrenaline rush, ‘and they’re off’ it was brilliant, including me! Whether it was the adrenaline or just sheer determination not to be left scooting I got straight on that bike and was riding along with everyone else. As predicted I was tail end Charlie before we were out of the arena, and I’m sure at least 20 of my heart beats per minute were entirely attributable to nerves of people watching (I know they weren’t watching me but it’s just that whole thing) I was saying to myself ‘just get round the corner, out of the arena, out of sight and you can relax a bit’ and that is exactly what I did. By now, as I say I was a long way off the other riders, but that was entirely fine. Now to ride my race, and take from this the things I wanted. First just to do my best, ride the fastest I could allowing for my level of fitness combined with my very elementary level of skills. After riding through a couple of fields the course took us into the woods, and here the fun really began. Twisting and turning, riding the fastest I dared I was beaming, I came round a corner and there was a big tree root on the wrong camber standing quite proud with another tree really close…arrrggghhh! Over it girl! Hang on tight!! Onward, this was just great…pushing myself physically, mentally and technically. Yep the pack was long gone, but this was me racing me, pushing My-self, seeing what I could do. Of course one disadvantage of being so far off the pack is you don’t have anyone to follow and at one point I thought I might have gone the wrong way and half expected to see a marauding herd of MTB racers heading towards me at speed (not sure what the collective noun for lots of MTtBer’s is) but all was good. Racing along assuming I would soon be lapped I was surprised to spot the back of the pack not so far ahead ,crossing a field, so there’s a chance I could make some gain however briefly. Pride comes before a fall they say…and just then I lost focus having noticed the photographer off to the left, and at that moment there was a pretty sharp right and up over roots. Bang! This girl aint making that, and worse still I jammed my bad ankle, searing pain shot through it, they probably heard me yelp and say ‘damn’ back in the arena, but I’m used this so just got on with walking the bike up the little ascent and back on and riding. The whole course for me was a technical challenge going flat out, normally I would have gingerly made my way across roots, round the corners but on this occasion I just threw caution to the wind and with gay abandon took everything on with two exceptions, a small log and a small jump. At the log there was a gentleman who said I could’ve easily made it, I had the speed, but the landing would probably have been my undoing, and may well have hurt my ankle again. On and on the course went. I had thought I’d just do one lap, that would tick the box of having participated in a race, but as I came out of the woods into the field where the arena was, there were a lot of people. I learned later that this was the ‘pit area’ for crew to hand drinks etc. to the riders. Anyway, as I came through, I was flabbergasted to hear a few people call out ‘well done Lynn’ …’keep it going Lynn’ and all such encouraging words. I had plenty of time to do at least one more lap, and felt I really couldn’t stop now after just one lap when there had actually been people cheering for me, yes me!! Besides I’d paid for up to 5 laps, a practise, and 4 race laps, but there was a reason, so much more important than any of this to carry on…I was love love loving it, it was great, it was brilliant, why stop when I was having an absolute blast..why indeed…so I carried on. I will admit to stopping once I had exited the arena, I was gasping for air and gasping for a drink, once recovered on I went again, lap 2 just about without incident although it was close several times. 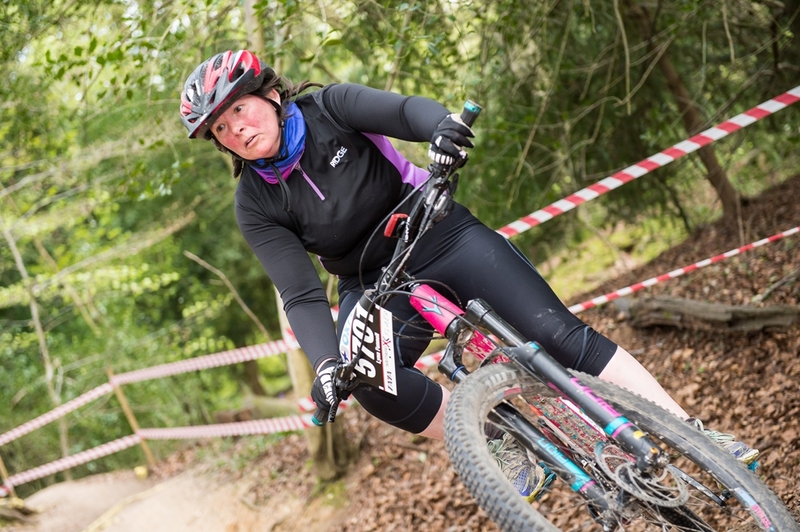 ‘Race Face’ …actually I was narrowly avoiding landing in the photographers lap on Lap 2! I came back into the arena at the end of the second lap and again several people cheered me on, which was great, but this time I decided I should stop. I could’ve carried on, but I had achieved my goal, I had raced, I’d pushed myself physically, mentally and technically, and now tiring the chance of getting it wrong was growing, and I wanted to remember this as a great experience that I walked away from, not one that I was blue lighted away from. Had I been in a race for a place I may have carried on, but I wasn’t. I recorded a race result. Last. Slowest rider of everyone on the day. But. I raced, I loved it, I improved as a rider, and as for my overall position and my time, they’re pretty academic, this was about so much more than times, finishing positions, it was about confidence, enjoyment and fun. I was grinning like a Cheshire Cat, beaming, I would definitely have won the prize for biggest and most smiles of the day had there been one, It ticked every single box and is a memory that will be with me, and that I will cherish forever. 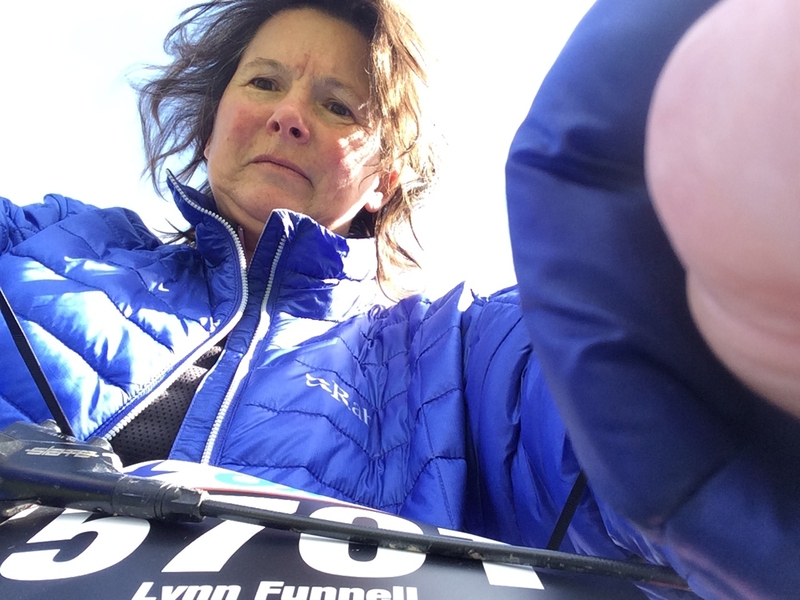 So what did I post to Instagram after the race…. ‘And this is the face of the girl who said 'I can, I will' and did! I came last by a mile but loved it! Did stuff I'd go timidly towards normally but just rode, couple of things even adrenaline couldn't persuade me to do and some I stuffed up! There’s often a lot of discussion about female representation in MTB, how we are catered for by the manufacturers of MTB kit, sponsorship and ambassadorial roles for females, and whilst it is most certainly, to my mind at least, a male dominated sport it is most definitely one I would encourage women to consider. There are so many events out there, competitive and non-competitive, whether you enjoy downhill craziness, XC, stage racing, or just fireroads and blue runs at trail centres. It’s for all ages, whether you are young, old, thrill seeking or just want to get out with friends for a nice ride in the great outdoors. I’ve made lots of friends in my short time of riding MTB and been to some really lovely places to ride. As for racing, the Open Category at SSXC really does cater for all, and is a great place to start, and I know it is a cliché but it really is true that if I can you most certainly can.